Innovative Bold Styling: Our Billet Designer Bolt Cap Covers mount on top of your factory bolts under the hood and match our Billet line of Cap Covers for your 1979-2010 Ford Mustang. 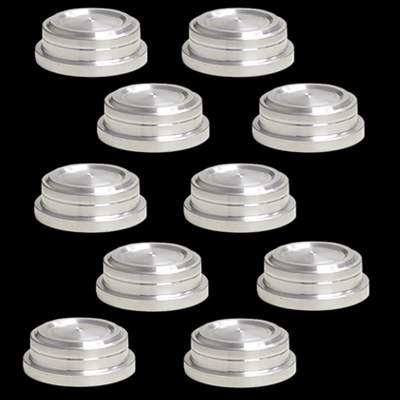 These cap covers are sold in sets of 10 and fit 8mm & 5/16" bolt heads. Installation is as simple as using a dab of clear silicone and pressing the cap on. Quality Construction: CNC Machined from 6061 Billet Aluminum for a perfect fit including the Diamond cutter final pass giving it the best finish possible. No one else gives you the bold clean styling of our Aftermarket Dress Ups, Suspension and Performance Parts for your American Muscle Car like UPR Products! Installs in minutes with automotive silicone adhesive (not included). Click Here for Application Chart Click Here for Install Article Fits these Vehicles: 1979 1980 1981 1982 1983 1984 1985 1986 1987 1988 1989 1990 1991 1992 1993 1994 1995 1996 1997 1998 1999 2000 2001 2002 2003 2004 2005 2006 2007 2008 2009 2010 V8 GT Cobra Mustang Steeda Roush & Saleen Vehicles. Made in the USA!